BRASELTON, Ga. (October 14, 2018) – The pair of Soul Red Crystal Mazda RT24-P prototypes finished second and third in the grueling Petit Le Mans at Road Atlanta on Saturday night, securing their podium positions right as the checkered flag fell. After qualifying in second and third, both Mazdas factored into the battle for the Prototype race lead throughout the ten-hour race. 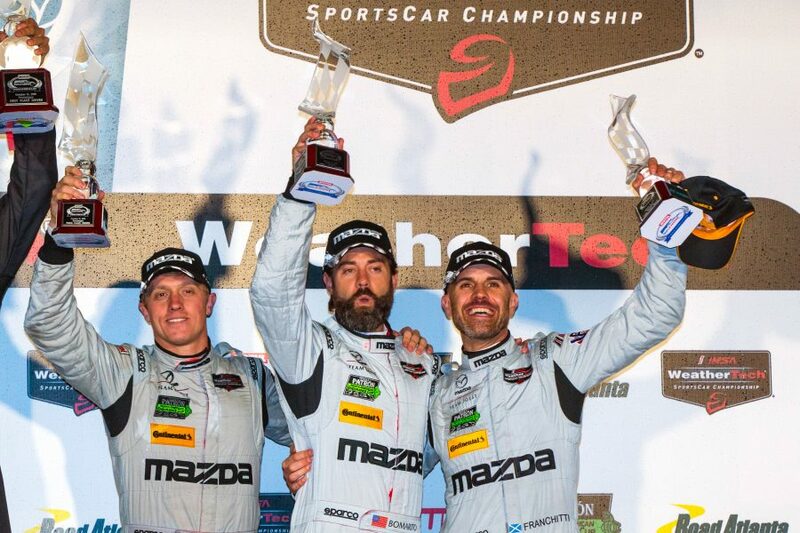 However, the two cars took different paths to the podium in the final IMSA race of the season. The No. 77 Castrol/ModSpace Mazda RT24-P driven by Lucas di Grassi, Oliver Jarvis and Tristan Nunez had a relatively trouble-free run, leading multiple times throughout the race. The No. 55 Mazda RT24-P, started by Jonathan Bomarito and also driven by Marino Franchitti and Spencer Pigot, led the early stages of the race. Contact forced the team to change both the nose and tail of the Mazda RT24-P, and the drivers had to recover after going a lap down while making repairs. Bomarito was able to regain the lead lap in the seventh hour of the race, allowing Pigot, who took the Mazda over with two hours to go, to battle for the win with Jarvis in the No. 77 Castrol/ModSpace Mazda RT24-P just ahead on track. As the Prototype teams began to take their final pit stops, the team opted to give up track position to ensure enough both cars had fuel to make it to the finish. In the closing stages, the two went from sixth and seventh to third and fourth positions and then, on the final lap as both cars approached the checkered flag, they passed the second-placed car in the final corner. The 2019 IMSA WeatherTech SportsCar Championship will begin with the traditional Rolex 24 at Daytona on January 27-28, 2019 at Daytona International Speedway.